The gents were super fast and super helpful, nothing was to much bother for them. They made the whole thing look easy. Roberts & Denny’s furniture removals are the perfect company to choose when it comes to moving your belongings. We understand that your furniture is some of the most valuable and treasured possessions in your home. Preserving your furniture’s pristine condition during a move requires the expertise and skills of a professional moving company. With over 85-years furniture moving experience, Roberts & Denny’s ensure the safe collection, delivery and secure storage of your furniture. Serving throughout London & Greater London, our large fleet of vehicles gives us the capacity to move all types of furniture. Our professional team will ensure your furniture is wrapped, loaded and unpacked with the utmost care; you can leave it up to us to do the heavy lifting and manoeuvring. We pride ourselves on paying meticulous attention to detail in every part of our removals work. For total peace of mind we are fully trained in handling fragile & expensive items with complete care. All of our work is fully insured so you can enjoy your moving experience safe in the knowledge that we have you covered. For total convenience we offer completely flexible services to fit with your time, budget, and any other personal requirements. To ensure this, we provide a free survey and quotation that is tailored to your needs. Fill out our quick quote form today! Simply contact our team of experts by calling 020 7635 5332 or fill out our online contact form today for further information about any of the services we provide and we’ll be happy to discuss your individual requirements. All packing boxes are designed and made to be extra strong and durable. Our boxes are double walled and twice as strong as most boxes you will buy. Delivered within the M25 only. We offer free delivery within the M25 on orders over £60 within office hours. If you require delivery outside of these hours please call us before ordering. If you are using our London removal services, we will deduct 20% of the cost of your packing materials from your removal quotation when you book. Download our helpful home & office move checklist. Errors were found on your Removals Quote submission. Please go back and check your details. 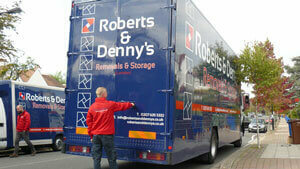 Why Choose Roberts & Denny's Furniture Removals London? Thank you, we will be in touch soon. If your enquiry is urgent please call 07956003220. 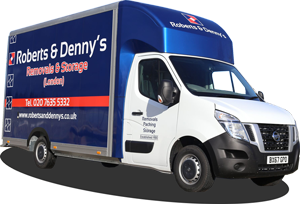 I am so pleased with the customer service received from Robert & Denny's that we have selected them to be a trusted supplier for all our future office and storage removals. Not only did they respond quickly and with all the information I needed but they managed to help me out with a client and therefore allowed us to show amazing customer service! I like well organised and informative people and the staff tick every box. Thank you so much Lila, Kevin, Martin and Team! I am looking forward to building a strong working relationship! Thank you very much indeed for a really flawless service for our house packing and move 2 weeks ago. Ollie and his team couldn't have been more helpful and organised. In a move where things kept going wrong, Roberts and Denny's were the only thing that kept going right. Fast, friendly and flexible, they always found a way of making it work, even when the dates kept shifting. I’m writing to say a big thank you to the team who helped us move from Merritt Road to Crofton Park Road in SE4 on Thursday and Friday last week – they were all extremely hard working and helpful, and made a stressful situation much more tolerable for us. We are particularly grateful to Paul, who did the packing – he worked very swiftly but considerately. Just to say the guys were absolutely fantastic on Saturday, couldn't help enough and made the move so much smoother. Will deffo be recommending you guys to my mates. Roberts and Denny’s are proud to support St Christopher’s Hospice. We provide the use of our removal vans and staff to help with moving stock and assist on household collections and deliveries. St Christopher’s combines care, education, and research to provide skilled and compassionate end of life care in the community serving a diverse population of 1.5 million in 5 south London boroughs – Bromley, Croydon, Lambeth, Lewisham and Southwark. It costs £20 million each year to deliver these specialist palliative care and family care services free of charge to patients, of which approximately £14 million must be fundraised each year. Craig is doing a sponsored Sky Jump on Saturday 3rd March 2018 to raise money for the Charity Muscular Dystrophy UK.